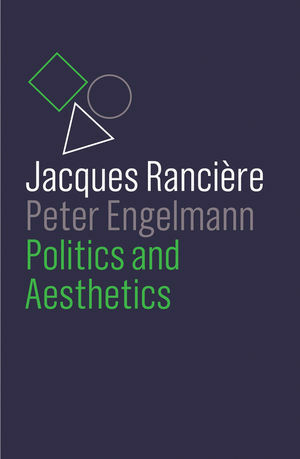 In this book the influential philosopher Jacques Rancière, in discussion with Peter Engelmann, explores the enduring connection between politics and aesthetics, arguing that aesthetics forms the fundamental basis for social and political upheaval. Beginning from his rejection of structuralist Marxism, Rancière outlines the development of his thought from early studies on workers’ emancipation to his recent investigations of literature, film and visual art. Rather than simply discussing aesthetics within narrow terms of how we contemplate art or beauty, Rancière argues that it underpins our entire ‘regime of experience’. Focussing on political relations in particular, he shows how these develop fundamentally from sensual experience, as individual feelings and perceptions become the concern of the community as a whole. Since politics emerges from the ‘division of the sensual’, aesthetic experience becomes a radically emancipatory and egalitarian means to disrupt this order and transform political reality. Investigating new forms of emancipatory politics arising from current art practices and social movements, this short book will appeal to anyone interested in contemporary art, aesthetics, philosophy and political theory. Jacques Rancière is a leading French philosopher and Professor Emeritus of Philosophy at the University of Paris-St. Denis. His many books include The Politics of Literature, Aesthetics and Its Discontents and The Future of the Image. Peter Engelmann is a publisher, philosopher and editor at Passagen Verlag.